Missed the first ever BDJ Box Beauty Social? Don't worry because the second one is happening in three days! BDJ Box is a monthly beauty product discovery subscription service, brought to us by the company behind the famous Belle de Jour planners. And from what I've seen, it's one of the best boxes currently available here in the Philippines. Why? Just read my BDJ Box unboxing posts *here,* and you'll see why! A few months ago, BDJ Box held the very first Beauty Social, where we got to learn more about beauty and skin care through BDJ's partner brands and guest speakers. 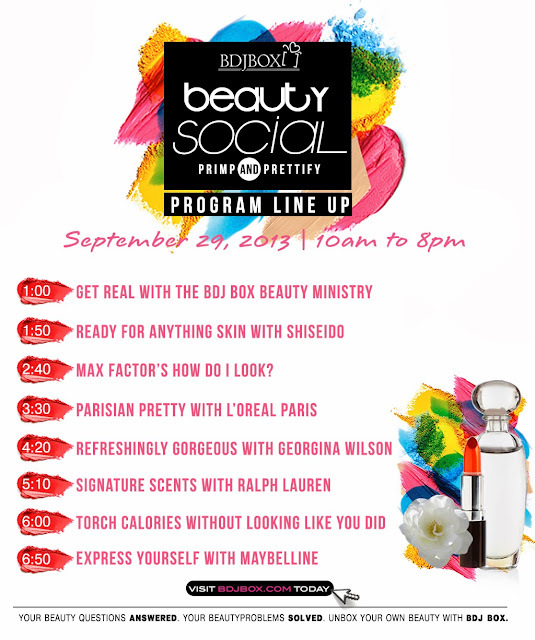 This coming Sunday, Sept. 29, 2013, at SM North Skydome, 10 am - 8 pm, BDJ Box will be holding their second Beauty Social with the theme Primp and Prettify! BDJ Box's partner brands will have booths there that you can check out. Celebrate your most gorgeous self with BDJ Box and their partner brands - Shiseido, Too Cool for School, Lucido-L, Bifesta, Celeteque, Yves Rocher, L’Oreal Paris, Ralph Lauren Fragrances, Revlon, Max Factor, Maybelline, Covergirl and Garnier. There will also be eight talks about beauty, skin care and health that you can attend, and each person can attend up to two. The event is open to and free for everyone, BUT only pre-registered girls will be allowed to participate in the talks, get a loot bag and have their pictures taken at the photobooth. Slots will be given on a first-come-first-served basis. To pre-register for any of the talks, simply email events@bdjbox.com the following information. I'm not sure which talks are still open for pre-registration and which are already full, but you can still try! 1. Refreshingly Gorgeous with Georgina Wilson. 2. Parisian Pretty with L'Oreal paris. I'm already pre-registered for the 3:30 and 4:20 talks. Going with my sister! For more info on BDJ Box, visit the following sites. 3:30 and 4:20 :) see you there! 1.max factors how do i look. 2.refreshingly gorgeous with georgina wilson. 3.Parisian pretty w/ l'oreal paris. Hi, Monika! Thanks for joining! You're now have slots in the following talks. Hi, Abby! Thanks for joining! You're now have slots in the following talks. Hi, Dovi! Thanks for joining! You're now have slots in the following talks. Hi, Aiko! Thanks for joining! You're now have slots in the following talks. 1.refreshingly gorgeous with georgina wilson. 2.Parisian pretty w/ l'oreal paris.